Along coastal Connecticut state parks such as Madison’s Hammonasset Beach, East Lyme’s Rocky Neck, and Groton’s Bluff Point, the Atlantic Horseshoe Crab is perhaps one of the most peculiar and misunderstood creatures to make an appearance in intertidal waters of Long Island Sound. If you regularly make it out to any of these parks in Late Spring, you’ve probably seen at least a few of these ancient ocean-goers approaching the shore to breed. 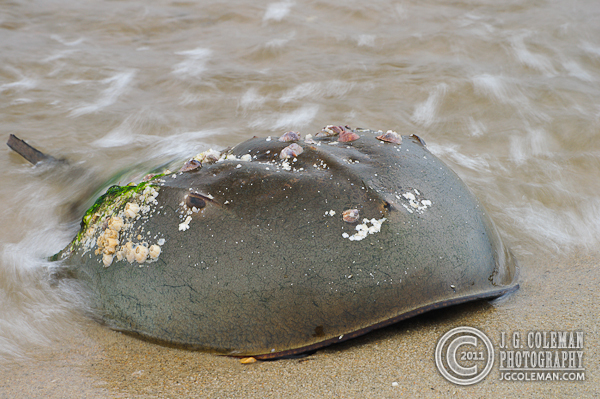 Although we call them ‘crabs’, Atlantic Horseshoe Crabs aren’t actually ‘true’ crabs; they aren’t even crustaceans. The closest relatives with which most people are familiar include spiders and scorpions, however even these cousins diverged paths with the horseshoe crabs long, long ago. Hikers or beach visitors that happen upon a horseshoe crab will be interested to know that they are one of the oldest forms of ocean-going arthropods in existence today. Although the Atlantic Horseshoe Crab, as a distinct species, seems only to be about 20 million years old, archaeologists have determined that nearly identical horseshoe crabs were prowling the coastlines of Pangaea at least 250 millions years ago. Truly a shining example of evolutionary success, the horseshoe crab has remained nearly unchanged through countless climatic upheavals. When others perished, the horseshoe crab persisted. The earlier relatives of horseshoe crabs (which were also somewhat similar to the present-day forms) first emerge in the fossil record roughly 450 million years ago. Between the mid-1800s and mid-1900s, Atlantic Horseshoe Crabs were severely over-harvested off the Atlantic Coast. For example, one account suggests that well over 1,000,000 individuals were collected within a mile of Cape May, New Jersey in 1856! Rare photographs from that era show countless thousands stacked up beside the shoreline, waiting to be turned into fertilizer. By the later half of the 20th century, the harvesting of the Atlantic Horseshoe Crabs had greatly decreased, but there’s no question that the damage done to their numbers during earlier times has had lasting effects upon their population. Now, as harvesting of horseshoe crabs has once again become popular for their use as bait in shell-fishing industries, many states have recognized the importance of preserving this species. Although not currently endangered, the Atlantic Horseshoe Crab is known to be experiencing a continual decline in population throughout most of its historic range. Luckily, there are some things we can do to be good stewards of the environment and help to preserve this ancient creature. First and foremost, keeping Long Island Sound clean is critical to the survival of every marine creature in the ecosystem. But, more specifically, if you’re hiking at one of Connecticut’s coastal state parks and see a horseshoe crab that has inadvertently flipped upside-down beside the water, give it a helping hand! The Ecological Research and Development Group has estimated that as many as 10% of the horseshoe crabs that hit the shoreline to breed each year end up getting immobilized when rough waves toss them on their backs, leaving them exposed to predators and intense heat as the tide withdraws. The simple act of flipping them back over, allowing them to safely return to the ocean, can have a truly beneficial effect on the size of future populations. Some historic photographs portraying the harvest of horseshoe crabs can be found on the Evolution page. (The photograph of Atlantic Horseshoe Crab seen here may not be reproduced or distributed for any purpose without the express written consent of Trails of Freedom, LLC).